2015-2017’s Ninjak by Matt Kindt was one of the unquestioned comic highlights of the last few years. A masterful action comic filled with incredible character work, narratives and world-building, all rendered under a phenomenal team of rotating artists. 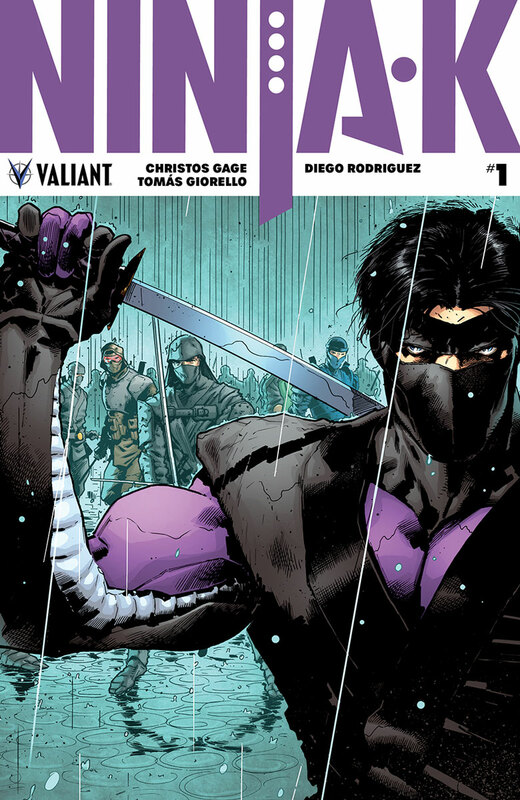 Bringing back the character of Colin King, Ninjak, a once member of the Ninja- program and now freelancer to MI6, to the Valiant Universe. A seminal run in Valiant’s halls of hits. So with that in mind, Christos Gage, Tomas Giorello and Diego Rodriguez definitely had big shoes to fill for the new Ninjak ongoing, and they filled them more than snuggly. In Ninja-K #1, a perfect new jumping on point for any new readers, the first half of the issue fills us in on the history of the Ninja- program – MI6’s set of super spies, selected agents trained in the ways of ninjutsu and martial arts to be the organization’s most powerful assets. From a Japanese ally simply called “The Ninja”, we move from the program’s origins to its teacher and student process, to its present day incarnation with our protagonist Colin King as Ninja-K (hence the title); a history that was only hinted at in Kindt’s run. All of this is narrated by a retired Ninja-D to Colin, with Gage injecting the perfect amount of character and smarm to Ninja-D as narrator to make the exposition feel as natural and as interesting as Giorello’s depictions. It invokes a lot of what made Immortal Iron Fist by Brubaker and Fraction so memorable, and is equally as accessible as that run for any reader new to Colin King and his escapades. It also helps to make the idea of a British Ninja a little less ridiculous. The second half opens up the actual narrative of this arc. Someone is killing off retired members of the Ninja- program, and MI6 wants to recall all those left alive into hiding. But of course, Colin won’t stay down and begins his search into anyone who might know about the killer, entering into a world of pain as the killer’s identity is only hinted at, with both Colin and the reader understanding that the new antagonist will be one of Colin’s biggest threats yet. It’s the perfect setup for a spy story, with all the action, intrigue, mystery and character that one issue could provide. The issue knows when to slow-down, build tension or blow us away with jaw-dropping fight scenes by the masterful art team. And the art is the key to making this story so successful. Tomas Giorello’s art and Diego Rodriguez’ colours had already won me over with their work on X-O Manowar this year, and Ninja-K #1 continues their immaculate and detailed work. In the new settings of Ninja-K and the time-jumping story, Gage gives these two a wide range of scenarios and scenes to work with as Ninjas making their way through 20th and 21st century history, carving up their enemies. These two capture your attention with full page spreads of Ninja-A leaping through a window, carving up the enemy with every soldier’s face filled with emotion, or a less complex page of Colin seeing Amanda off into the rain swept night-time streets as he broods into his reflection on the glass of his apartment window. Every page can be scanned for ages, picking up every detail these two have packed into these pages, with Rodriguez’ lavish colours making every page pop. The perfect duo. My only real complaint with issue however would be Colin himself. With an issue that sets up the world around him so well, Colin doesn’t quite get the spotlight to show what Gage can do with this character outside of his skills on assignment as Ninjak. Kindt gave Colin the perfect level of brooding, charm and snark that made him such a fun character to see at play, and it’s just not given time to shine in this jam-packed issue. All in all though, Ninja-K #1 is a spectacular opening issue. A perfect show of what a great action comic and a great Valiant comic will bring. Non-stop pacing, filled with history, action, intrigue, mystery and mayhem; Ninja-K kicks off a super spy epic to remember, with some of the most stunning art of the year. And for 40 pages of incredible content for $3.99, there is nowhere to go wrong.